New York’s Times Square has proved to be one of the more popular icons in the 20th and 21st century, notably for it hosting a classic New Year’s Eve party at the turn of 31st December every 365 days, give or take a day where leap years are concerned. Well, this chameleon-like venue looks set to thrill folks yet again – by bringing Mario’s 3D world into our reality. 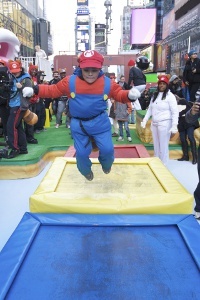 Yes sir, Japanese gaming giants Nintendo have certainly outdone themselves this time around, as New Yorkers were invited to ‘play’ inside Mario’s World as they had an intimate look at Super Mario 3D Land for the Nintendo 3DS. After all, you can’t really tell how a person feels until you put yourself in his or her shoes, and what better way to understand how the rotund plumber’s life is like than to jump around in an actual 3D platformer? You not only get to enjoy life size warp pipes, trampoline coin jumps as well as a flag pole finale, you will also be able to enjoy a special opportunity that allows you to play Super Mario 3D Land ahead of its official release – which happens today, actually. What a great way to kick off Sunday as you laze around the home, guiding Mario through nefarious puzzles in a 3D environment. Apart from all of the Mario’s World 3D gameplay experience has to offer, attendees are also be able to enjoy other goodies such as a performance from a mass group of Nintendo characters at the start of the event, a set of exclusive Tanooki ears and tails that was featured in the original franchise, which will be rewarded to fans onsite throughout the event – as long as stocks last, of course. I do expect these to arrive on eBay sooner rather than later as scalpers take advantage of the situation. There is also a “Mushroom Kingdom” Pizza truck located nearby that delivers free mushroom pizza slices to the first 1,000 consumers onsite who tweet using the #SuperMario3D hashtag. There will also be a limited early sale of Super Mario 3D Land at Toys “R” Us located in Times Square, but that has already happened yesterday. Wow, looks very interesting.. It’s one of my fave game actually and testing it in real life will definitely more fun and exciting. Can’t wait to try it.